As we ascended from Elk Lake, we began to traverse a ridge above Jemrod Creek that offers beautiful views of Mt. Olympus, and all its glaciers. Snow Dome is easily seen in this photo. “I think we’ll do 15 miles the first day,” I announced looking up from the wilderness map. “But the first 13 miles are REALLY flat,” I continue in hopes of quelling the looks of skepticism that Hanna gives me from the adjacent couch, “Don’t let the mileage scare you: we’re reasonably fit people, we’ll be fine.” I think I also said this to reassure myself that the trail I picked would be doable in a three day weekend. I will admit – 15 miles in a day seemed like a lot. But with the time constraint, I couldn’t figure out how else to spread out the mileage. Surprisingly Hanna doesn’t seem phased by the proposed expedition. “It’ll be fun!” I exclaim. 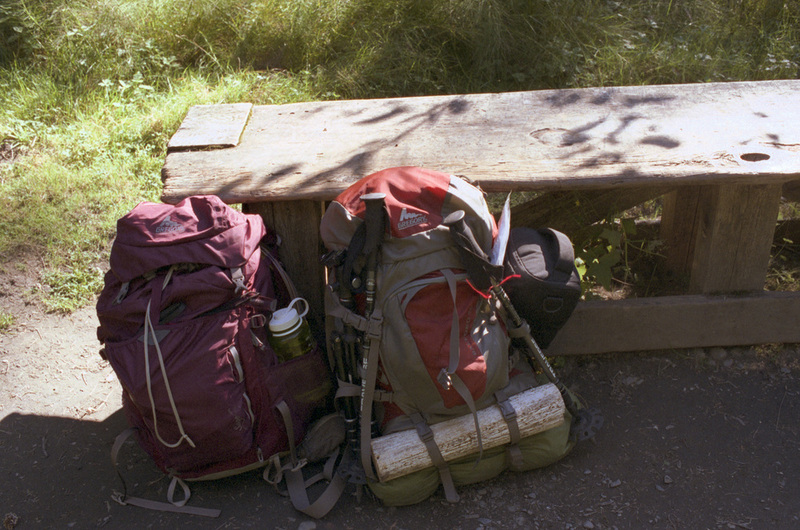 All summer, we’ve been talking about doing a backpacking trip. I hadn’t been out in the backcountry since the Enchantments and was itching for some adventure time before winter sets in. And Hanna, just moving to the Northwest, was ready to explore her new home. So, it was settled – we were going to go to Olympic National Park and over the course of three days/two nights, backpack up the Hoh River Trail all the way up to Blue Glacier on the flanks of Mt. Olympus. 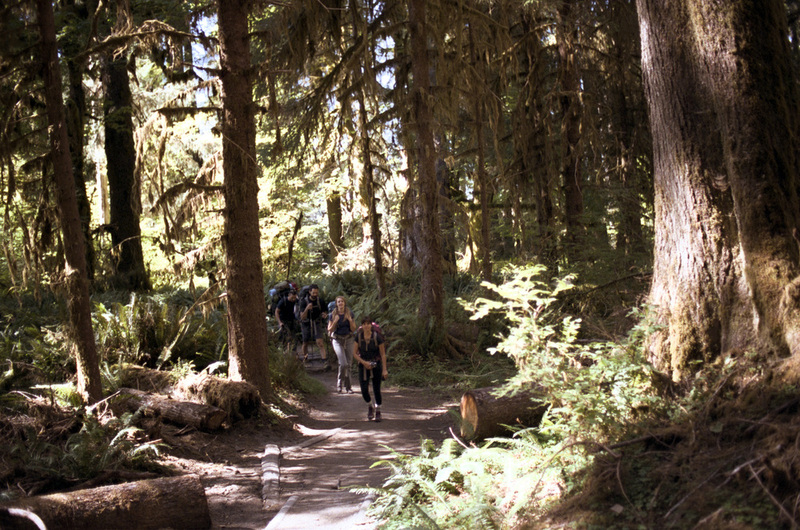 Olympic National Park had been high on my to-do list since I moved to Portland. It is on a large peninsula in Washington, southwest of Seattle. 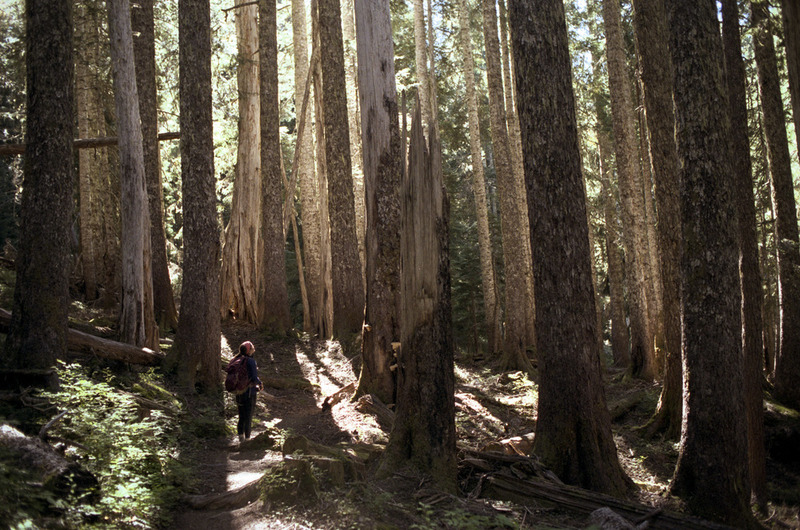 The park is gold mine of biodiversity, as it encompasses several unique biomes, including the ocean coast, temperate rainforest, and glaciated alpine peaks. The park was designated as a national park in 1938 by FDR. Of course, we finally picked a trail to do and a destination only a week before our planned departure. I frantically contacted the ranger station for a wilderness permits, and even convinced some other friends to join us. After making the long trek from Portland the night before, we arrive at the trailhead at around 11am and embarked on a long three days of backpacking. We started the trail with a crew of six – Hanna and I, my good friends Temo and Jennifer, and two of Temo’s friends from Sacramento, Sven and Gene. The crew stuck together for the first two miles or so. Hanna and I pulled off from the trail for about 5 minutes to take photos. When we returned to the trail, we did not see our friends in either direction. We assumed they had passed us, and this was confirmed by another group of hikers on the trail. So we spent the rest of the day trying to catch up. Only shot I got of everyone before we got split up. Maybe a half mile in. 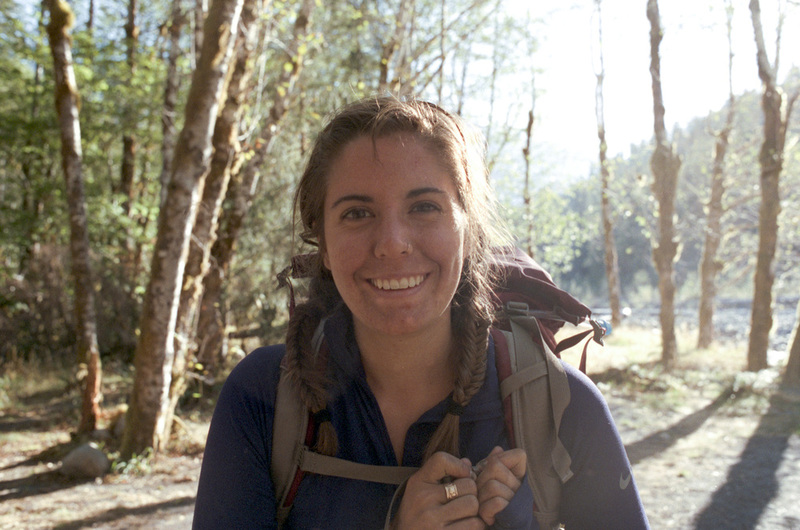 Hanna, looking bright-eyed and fresh before the start of a long three days of backpacking. Hanna showing her true love of the birch trees. The first section of trail was pretty flat, with slightly rolling sections as we crossed various creeks. 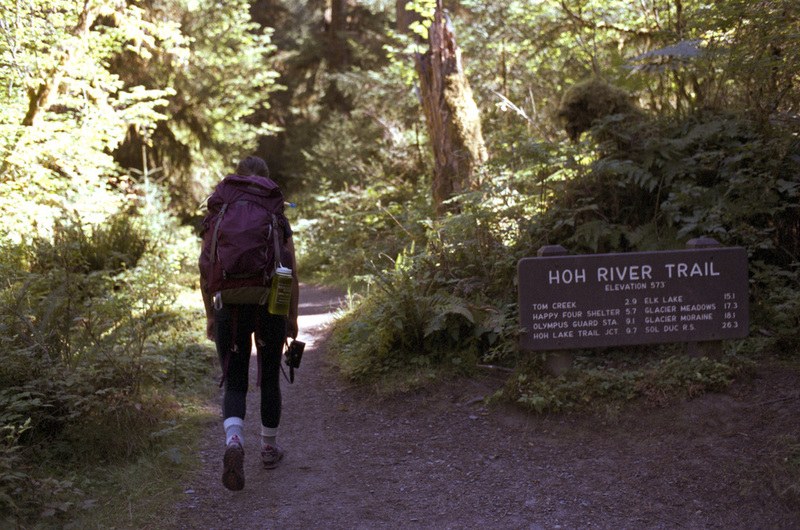 The trail followed the Hoh River as it cuts through dense, ancient rainforest. For miles, we walked among giant moss-covered logs, towering spruces, lush ferns, and thick birch forests. We were aware of the river, but it was often obscured by the forest. Along the way, we took many “creative” breaks. I gave Hanna my old Olympus OM-1 to give her a taste of shooting with film, and we spent our creative breaks taking photos and letting our legs rest. Gregory bags chilling out as we took a break at the Olympus Ranger Station Camp. 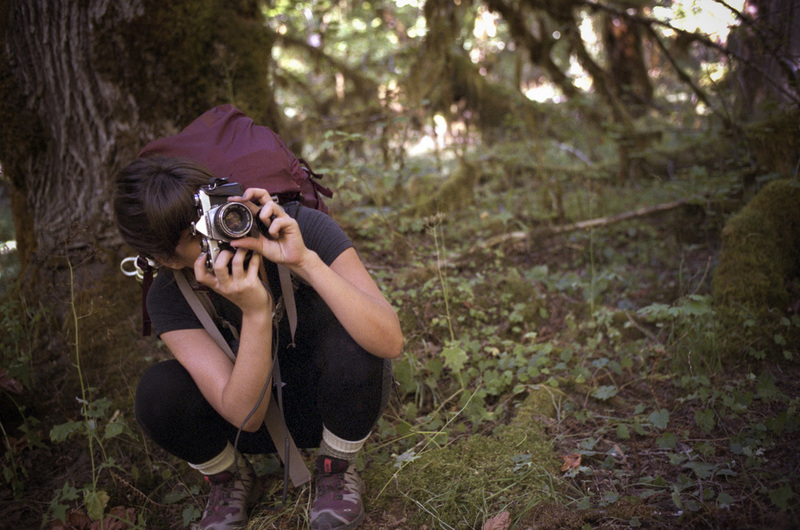 Hanna, getting in the prime position for a shot using her disposable camera at the Olympic Ranger Station Camp. Sometimes rolling around in the grass is fun. Red leaves of some of the trees along the river. Just past the Lewis Meadows campsites (10 or 11 miles in), the trail merges closer to the river as it becomes narrower and faster. Here, the water turns into a vibrant blue color as it rushes over gray river rocks. At mile 12.4, we began to depart from the river. What was once a flat and “easy” trail, now climbed steeply up the valley sides. This was the final push to our destination for the night – Martin Creek Camp. In 2.5 miles, we gained around 2000 feet of elevation. Though that doesn’t seem difficult, it was very mentally and physically taxing after already walked almost 13 miles. Both of my legs started cramping with each high step I encountered. After much cursing and frustration, we finally made it to our cute wooded camp spot, where we proceeded to collapse from exhaustion. To our surprise, we did not see the rest of our party. We expected them to be there when we arrived, with a fire raging and food already cooked. Though we were worried about our friends, we made a fire, gorged ourselves on food, and called it a night. The hardest day was over – 15 miles the first day. Suddenly the trip did not seem so ludicrous. Hanna on a giant fallen log towering above the blue waters of the Hoh RIver. Hanna, getting cozy with a log of moss as she stops to rest. This is around mile 10 or 11. Hanna on the High Hoh Bridge. After 12.4 miles, the trail begins to steeply climb for another 3 miles. This is around a mile into the steep climb. And this is why Hanna looks less than thrilled. Total Mileage – around 15. I was awoken the next day by the sound of a familiar voice. Temo had jogged up the trail to find us. He informed us that they were in fact behind us the entire time. They camped at Lewis Meadows the night before, and planned to hike back out to 5 mile island later that day. Since Hanna and I had already made it up here, we were determined to make the push to Blue Glacier. White Glacier and the shoulder of Mt. Olympus, with a creek formed by the glacier's runoff. We were suprised that we did not see this creek runoff in the hike in. It's amazing what you overlook when you are rushing to get to a destination. The entire hike out, we took our time and enjoyed the scenery we missed on the way in. A little ways into day 2, Hanna crossing a rocky section of trail. Our wooded campsite at Martin Creek Camp. We stripped down our packs to the essentials and set off on a day hike to the Glacier. It was an additional 2.5 miles to Glacier Meadows, and then another 1.5 up to the lateral moraine of Blue Glacier. The trail climbed another 2000 feet or so, though after a night’s rest, the elevation gain seemed much easier. 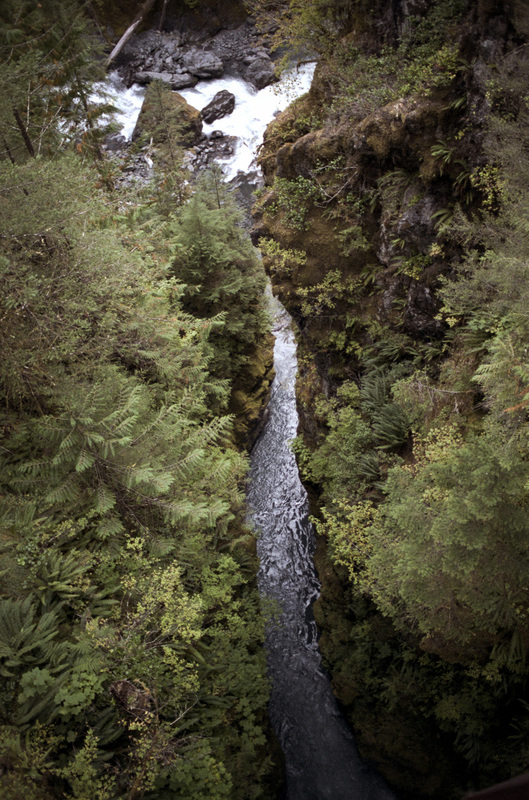 The trail hikes mostly through the forest until the trail cuts the steep sides of the valley above Jemrod Creek. From there, we were rewarded with beautiful view of Mt. Olympus and all its glaciers. After many miles of backpacking, we finally reached our destination: Blue Glacier. It was almost 20 miles into the hike. This is what we set out to get to and was our halfway turn-around point. It was breathtaking. We ate lunch perched above the glacier. Surprisingly, the glacier was still there in September, even after a hot summer. After hiking the majority of the trail in dense forest, the final push to the lateral moraine from Glacier Meadows started off in a beautiful open meadow, glowing in a vibrant yellow color. After we crossed the meadow, the trail cut up a very steep talus field that seemed to go on forever. Finally, we got to the lateral moraine that sits high above Blue Glacier. After a very long, flat hike in, and a long steep climbing through forest, meadows, and talus fields, we finally made it to Blue Glacier at the foot of Mt Olympus. We spend quite a bit of time hanging out at the glacier, taking in its utter beauty. Even after a hot summer, the glaciers around Mt Olympus are still full of ice in September. After taking an obscene amount of photos and scarfing our faces with lunch, we began the knee-pounding descent back to our campsite. After descending some 4000 feet of elevation in 6-something miles, we finally made it down to Lewis Meadows Camp. We found an amazing campsite along the river, and this was the view that awaited us. We decided to pack up our site and try to make it down to Lewis Meadows in hopes of shortening the Day 3 hike out. What we struggled to climb up the day before turned into knee pounding reminders of our utter fatigue. After the trail flattened out, we strolled into Lewis Meadows camp with blistered feet and tired legs. We arrived at our new home for the night just before sunset, when the golden sun illuminated our pristine riverside campsite. Finding such a beautiful place to finally rest was literally the perfect end to the day. We built a fire, ate a huge dinner, and kicked up our sore feet. That night, the Milky Way Galaxy could be seen overhead, and we fell asleep to the sound of the rushing river. Day 3 was a struggle. Legs exhausted, blisters in full force. For me, every step equaled searing pain. I felt sorry for anyone who had crossed our path, as they would have seen two very haggard looking humans. We rested all our weight on our trekking poles with each step we took. On the plus side, the slower pace allowed us more opportunities to take in the sights of the rainforest that we missed on our hike in. It seemed much prettier than I remembered. 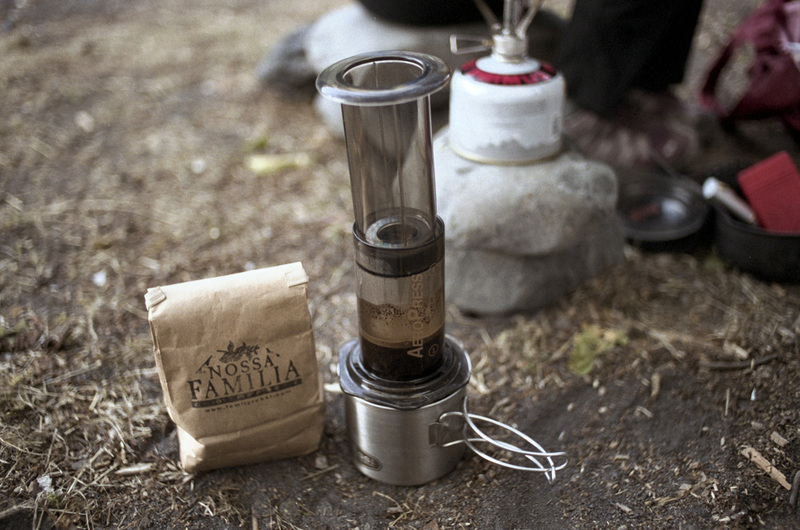 My Aeropress and a fine back of Nossa Familia espresso, ready to roll for breakfast. This was our Day 2 camp. After hiking to Blue Glacier, we decided to get the downhill slog over with in order to make our Day 3 a lot shorter. We ended up going back to Lewis Meadows Camp, and found the most perfect camp site right next to the river. It was much needed after the exhausted, knee-pounded descent. Hanna, looking as lovely as ever on the start of Day 3, right before leaving camping perfection. Also, we were continually encouraged by all the wildlife we saw on the way out. As we left Lewis Meadow, we saw a family of deer. Along with the squirrels, woodpeckers, and chipmunks, we also saw two enormous elk near the trail. Up to this point, the trail seemed devoid of animals, but the hike out was a zoo. A family of deer came out to see us off at Lewis Meadows Camp. We slowly trudge towards the finish line and got back to our cars at around 4:00pm on Day 3. Still not there yet. On the hike out, at nearly mile 35 or 36. But at that point, we lost count. The blisters and fatigue are the only thing on our minds as we limp to the finish. In three days, we backpacked in 38 miles. It was quite a trek, and probably would have been made much easier with an extra day. But we persevered, and I think it was worth the suffering I was very impressed with Hanna’s tenacity with the entire adventure. Many people would have complained and wanted to turn back, but she stuck it out. I always appreciate people with the drive and willpower for adventure. The Hoh River Tail to Blue Glacier was a gorgeous and challenging adventure, and perfectly fulfilled my craving for the outdoors. For now at least. 35mm photos were taken with the Nikon FM2 on Fujifilm NPH 400. 6x6 photos were taken with Hasselblad 500cm on Fujifilm Velvia 50.